Last week our poll covered multiple church services. 70% of churches offer multiple services, employing either multiple times, days or locations. Not quite half (45%) stick with multiple services on Sunday, and 30% are offering just one service. 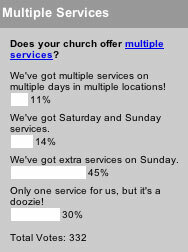 I’m not sure what I was expecting from this poll, but I do think it’s cool to see so many churches offering extra services. This week we ask about worship technology: hymnals, bulletins, fancy slides–what does your church use? Could Churches Be Using Location-Based Services Wrong? Poll Results: How Cool is Your Church Web Site?